The gruesome killing of three persons from a single family for allegedly practicing witchcraft at a lower Majuli Mising village in Jorhat district of Assam has sent shock waves to the entire Mising society. This is not the first time that news about inhuman physical and mental torture including gruesome killings like this is round the corner. 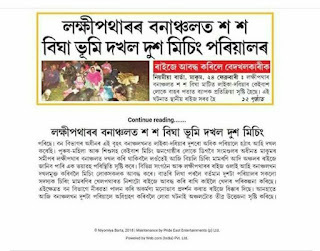 This is happening in the home and hearths of Mising people irrespective of north or south bank, Assam or Arunachal.in where literate (don't read as educated, please) young men in their teens and early twenties guided by village elders commits such imponderable and unimaginable crimes, that was least expected from the new generation at this age of information and technology. Are the Mising organizations still in mute mode? How much will our society become a case of ridicule, insult, anger and condemnation? What are really the causes of this enormity of superstition in the society? We must explore ourselves for urgent reformative and corrective measures, the condemning act committed by misguided people needs immediate attention. In the name of "moru" (witchcraft), we have observed that so much of ugly instances are happening to the people, especially among the lowest stratus of the society, as we all know the Mising villages remains in the margin of backward connected with bamboo bridge that last until next monsoon, with impeccable features of non-provincialized venture schools, absence of rural health care centers, without electricity but with irregular mobile networks and radiowave. Proper sanitation is far cry, safe drinking water and all weather metallic road are even more. That day, it was a wife-husband duo from Dhakuakhana were roving helplessly until a Mising reporter with an Assamese daily exposed the incident of neck-deep tortured of the woman, today it is all three of a family with their teen age school going son, who refused to follow village directive and stood up. They paid their lives for their courage, scathingly. All culprits are between age group 16 to 24. One class eleven boy ,age 17, according to a regional Assamese newspaper of Assam said, " We killed them for the good of the society, we have no regrets". The killers also allegedly defended their stance without expressing any qualm before the media at the police station in lower Majuli ," That was done according to our traditions and customs. We gave them notice to quit the village one year ago but they didn't listened". The media had gone to the extent of saying that the boys allegedly told them that they killed the three like the way pigs were butchered in the Mising society. The mom-dad-son trio were picked up from home at night on Aug 28 last by nineteen village boys and they butchered them one by one near Brahmaputra river side. They put their body parts in sacks before allegedly throwing away into the Brahmaputra river in the same night. 9 have been arrested so far(either they have voluntarily come to police station or villagers have pressurized the boys to surrendered), other ten are still absconding. Something is really MISSING in MISING society, reformation drive is needed urgently. Our growing youths are on astray. And what more? Given the context of gruesome killings of mom-dad-son trio in Borduwa Chapori at Majuli island, known as one among biggest river isle and seat of Vaishnavite culture of the world, we cannot ruled out the development angle for the recent witchcraft related murders and tortures in different Mising inhabited places. It is time to pressure the government for development, what is being granted and made available to advance various other communities, Mising people, especially the middle class, has an onus of responsibility for the greater good of the society. The Mising middle classes must keep an eye on the delivery of public goods to rural areas. Given that tortures and murders of community members are based done with inconclusive and illogical account of health related cases, even to the extent of death, at least health care access will do a lot in improving the people's social behavior. As it is evident that, the lower Majuli incident is executed with covert support from people within the said village Otherwise, we must say mere issue of warning will not work. Is it just the fault of the misguided village youths to act in such a gruesome manner to butchered an innocent family of three in the name of moru? What is the gap between educated middle and elite classes of the society with that of rural Mising inhabitants? Will the middle class (inclusive of Mising people reigning various community organizations and those silent spectators engaged in government, semi- government, corporate jobs) wake up to the needs of lower stratus of society at the time when such incidents have 'lower' the prestige of community? It is not to be limited to image make-up exercise at the time when it is dented by oft-repeating shameful incidents in the society.